Feliz Paseos Park features a universally accessible trail system enhanced with interpretive signs, and includes a parking area and a small plaza with a large ramada with two ADA accessible family restrooms. The park is located on a 50-acre parcel of lush desert near the northeast corner of Gates Pass Road and Camino de Oeste, just minutes west of downtown Tucson making access relatively easy. The park is intended for use by everyone, regardless of ability. The citizens’ advisory committee had representatives who are both able-bodied, as well as people in wheelchairs or with sight and hearing impairments. Feliz Paseos Park is a successful example of a public-private partnership and will make one beautiful area universally accessible to all. This is the first park in Arizona, and one of the first in the country, with a focus on universal accessibility. The Park has incorporated pioneering trail design and maintenance principles in use of leading federal, state, and local agencies around the country. At Feliz Paseos, the emphasis is on recognizing the special needs and capabilities of people with disabilities. The park features a recreational trail system of increasing difficulty that allows those in wheelchairs to determine for themselves if they want to attempt the challenges of a particular trail. The most encouraging lesson learned from Feliz Paseos is that the opportunity exists to create a universally accessible park model that communities across the nation can reproduce. The same design principles can be applied to open-space parks throughout the country with relatively little extra expense. The looped trails were evaluated and signed using the Universal Trail Assessment Process (UTAP). Rather than paving the wilderness, UTAP provides a means to measure the wilderness so more people can enjoy it. A system of Trail Access Symbols goes beyond the commonly used wheelchair icon to inform the public about the different levels of opportunity and challenges of using the trail. The signage gives maximum cross and running slopes, surface type, width, presence of obstacles, and other information. Users determine for themselves the level of challenge they want to undertake to experience the native desert and natural terrain. In February 1998, the Pima County Board of Supervisors formed a committee to explore the feasibility of acquiring a portion of the Las Lomas Ranch as the site for a park utilizing the concept of universal accessibility on native-soil trails. The committee was sensitized to universal accessibility as a more all-inclusive concept and several members were trained in the UTAP. The committee selected two members as its co-chairs: Mr. Bob Mora, one of the leading advocates for the disabled community, nationally, and here in Tucson, and Ms. Laural Park, a resident of the Tucson Mountains who lives adjacent to Las Lomas. Other representatives of the disabled community included several people using wheelchairs, as well as people with hearing and sight impairments. Other committee members included representatives from the Arizona School for the Deaf and Blind, Top Dog, Handi-Dogs, DIRECT-Center for Independence, Inc., TUSD, Corondolet Rehabilitation Services, Awareness to Access, Inc. as well as several environmental educators, and neighbors. 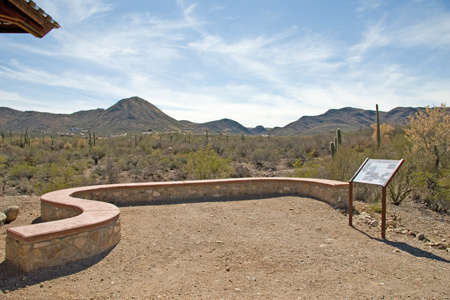 In addition to the uniqueness of the accessible natural trail system, the park’s architectural design is inspired by the design ethic used by the 1930’s Civilian Conservation Corps that locally constructed structures at Gates Pass, Sabino Canyon, and Colossal Cave. The Feliz Paseos Park is a successful public-private effort that will provide a unique addition to the recreational facilities in Pima County and serve an underserved population of users. The park was recently awarded a Common Ground Award in Architecture by the Metropolitan Pima Alliance.